Today marks my 3rd year living in Spain! Have I really been gone that long?? Oh, Sevilla! One of my favorite cities in the world. Ever since my first trip to Spain, I’ve absolutely loved Sevilla. It’s one of the places I considered when choosing a location in Spain. In the end, Madrid seemed a better and more central hub to find work. Back before I even stepped on Spanish soil I researched different things to do in Spain and added “la feria” to my list. When a roommate told me she was going in April it didn’t take much convincing before buying my RENFE ticket. “La feria” is a giant fair in Seville about two weeks after Semana Santa, so either in April or May. After experiencing it for the first time this year I can see myself going back again and again. Some things which stick out the most are the colorful casetas, and sevillanas dresses and music. This is also most likely what this fair is most famous for. Many families reserve their own caseta, or small house, for family and friends. Normally you can’t enter unless you know someone inside, though there are a few public ones. Thankfully, we were there with some people who lived there, so we were able to enter several. 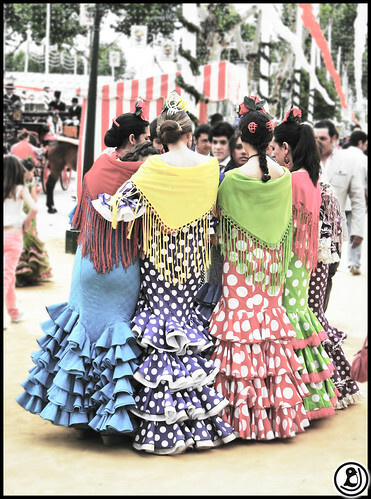 Most women wear colorful and sometimes extravagant sevillana, or flamenco, dresses. I felt a little awkward (go figure) asking people if I could take their photo, so I didn’t take any good dress photos. I think you can get an idea from this photo, though. So many polka dots! I found this video on Youtube from last years feria. Another feature of the fair are numerous horseback riders and carriages. Watching them trot down the street was like seeing a very, very Spanish glimpse of the past. It seemed each caseta was uniquely decorated. At night, the party was turned up a few levels. The music and dancing continued and spilled onto the streets. Like most places in Spain, you could stay in a caseta until the wee hours of the morning. Some common drinks in the casetas are rebujitos or manzanilla. Don’t let my serene expression deceive you. I probably had one too many rebujitos by this point. I plan on going next year! The next feria will be May 5 – 10 2014. Maybe I’ll even have a dress. Have you ever been to la feria or Sevilla? Back in April, my grandparents flew from New York to Madrid to visit me. I wasn’t exactly sure of our plan until they arrived and I discovered we would rent a car then drive to Barcelona and Zaragoza. Since I ran in a half-marathon that weekend, they went off on their own to explore cities near Madrid. I love driving, and it was awesome to drive in Spain again. The last time was during a December trip to Morocco. The drive from Madrid to Barcelona took about 4.5 hours. The first thing my grandparents wanted to do after we checked into the hotel was find a drink. Gotta love them! I wish you all had the chance to meet them, because they are crazy in a cool way. I want to be like them when I “grow up.” Some of the earliest memories I have of them is flying in their plane and visiting their law offices. Now my grandfather is retired, and travels around the world doing what he loves; taking photos. Several years ago now he even took his Harley Davidson out for a spin on his 82nd birthday. My step-grandmother is 15 years younger and still enjoying working and traveling. Our first dinner in Barcelona was at Tenorio. This place was very stylish and the food was really good. Next day we took a bus tour of the city. If there’s one thing I want to say to Barcelona it’s, “I’m not finished with you.” My grandparents weren’t feeling up to walking around too much and we didn’t go inside any of the tourist attractions. It’s okay because now I have an idea of what I want to see next time. We found some cool shops like this music shop. That evening we had dinner at 7 Portes which was another great restaurant, but very different from Tenorio. Delicious dinner at 7 Portes. My grandparents are characters! After Barcelona, we made our scenic way to Zaragoza. I probably drove through over 60 roundabouts and several small towns. The city was smaller, but lovely. I definitely want to return again to explore more. We visited the cathedral, walked around the streets, and ate and drank MORE. After this trip I felt like a complete blimp, but it was worth it. La Ontina is the restaurant in the NH Gran Hotel, and it was awesome. It was a bit comical when I had to do my best to translate everything on the menu and being said into English. Seriously delish! It was a sad parting when we arrived in Madrid the next day. I’m so glad they were able to come out to see Spain and me and I’m hoping that I’ll be able to visit them when I make the upcoming short trip back to the US. What places are worth checking out in Barcelona or Zaragoza? It’s now the middle of July in Madrid. It seems many people have left the city for the coast or their home towns. I can’t blame them. Maybe you can imagine it gets “hot as Hades” here. I believe I’ve only worn skirts and dresses since the last week of June. Many apartments don’t have air conditioning so you need to buy a fan to avoid sleeping in a pool of your own sweat. When I told my dad about this on the weekend he didn’t believe me. I am still apartment hunting and the one I’m hoping to move into has A/C! Glorious! I’d be living with two Spanish girls and they seemed really sweet. So cross your fingers for me! I’m not sure if I ever mentioned this, but the last apartment I was in had 8 people…so switching to a place with only 3 would be wonderful. So why am I in Madrid and not on vacation in Malaga or something? I’m working and trying to earn some money to hold me over until the end of September. My work contract doesn’t begin again until the middle of September and I won’t be paid again until the end of that month. I know some people have found cushy gigs in summer camps, but unfortunately I didn’t find any that would hire a US citizen and pay them decently. The one I was offered was 500 euros for living and working in a summer camp for the whole month of July. I couldn’t leave the residence hall so there was no way to earn extra money. Sometimes I wish I had dual citizenship with an EU country! Working here would be so much easier then! In Madrid I’m working several different jobs. My main job is to take care of a 4 year old girl every morning while her parents work. Then, in the evenings, I teach private classes almost every day. Right now I have 7-8 private classes a week. Then I am also working with a company who needed proofreaders to correct Spanish to English translations for a travel website. I’m not sure what’s happening in August, but I might be traveling. I’m still trying to buckle down and write about all of the other trips I’ve taken. I might end up lumping them all into one post. If you are in Spain for the summer what are you doing?